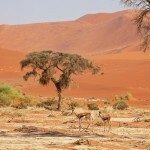 The flora of Sossusvlei provides a perfect habitat for many desert fauna. 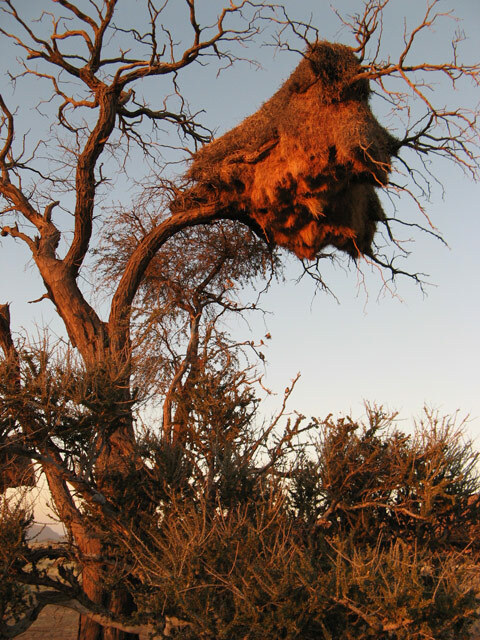 Countless weaver birds build their elaborately detailed hanging nests in the ramified branches of camel thorn trees. 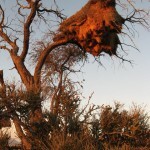 In the region of the salt pan, especially springbok, oryx, ostrich and other small animals such as reptiles and beetles live. 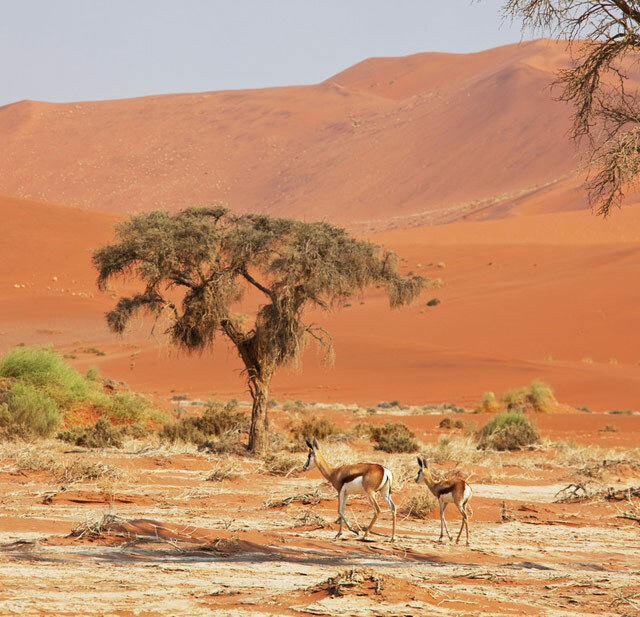 The fauna of the desert have adapted their lives perfectly to suit the brutal conditions, especially the Springboks which are found in large numbers. In the region around the vlei live the mountain zebra, leopard, hyena and desert foxes. When the vlei is filled with water, the wildlife flock to drink the refreshing water. It’s during this time that even waterbirds from the coast migrate to the otherwise dry clay pan. 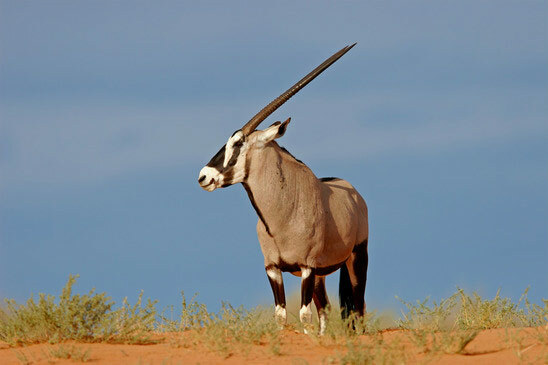 Oryx prefer the dunes around Sossusvlei and visitors will inevitably encounter the animal displayed on the Namibian coat of arms. The animals are perfectly adapted to a living in the hot desert. Studies have shown that the antelope can survive without water for eight hours at a heat of 45 degrees Celsius because of their very low metabolism. The antelopes become active in the late afternoon and at night to move as little as possible in the scorching heat of the desert. The animals can increase their body temperature and release the stored heat at night again. 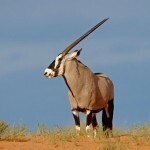 In the dunes of the Namib the gemsbok occur in large numbers. These animals are part of the genus oryx. A special subspecies are the Golden Oryx, which owe their name to their golden coat pattern. The animals are native to some game farms in Namibia and will be auctioned in part for the equivalent of up to 30,000 euros. Anyone who takes a closer will notice that the hot desert floor is home to countless microorganisms. 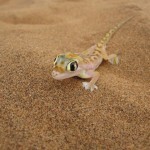 In the hostile ​​sand live beetles, spiders or reptiles such as geckos and chameleons. Beneath the sand some snakes lurk around and all you can see is the tip sticking out of the sand. The Peringuey’s Adder is one of the very few animals that prefer daytime dozing in the sand and goes on the prowl at night. The diet of the sideways-moving Viper consists mainly of small desert lizards and geckos. One bite is quite painful for humans, but it not harmful. 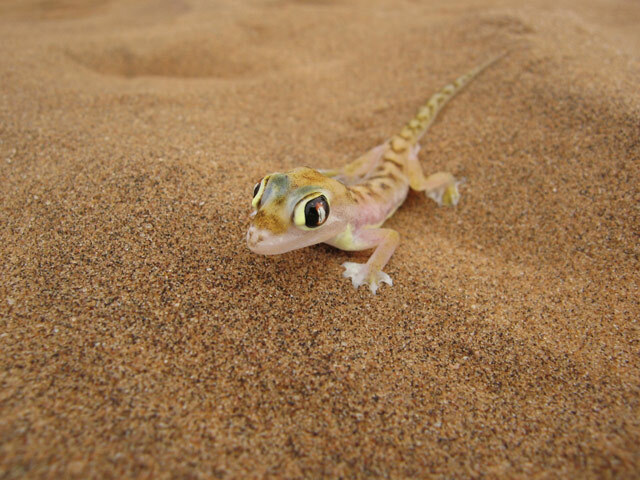 The Namib Sand Gecko manages running on the scorching desert sand only because he spreads his webbed feet and alternates legs when he’s standing still. There are also animals, like Fukomys, who simply have become completely nocturnal.